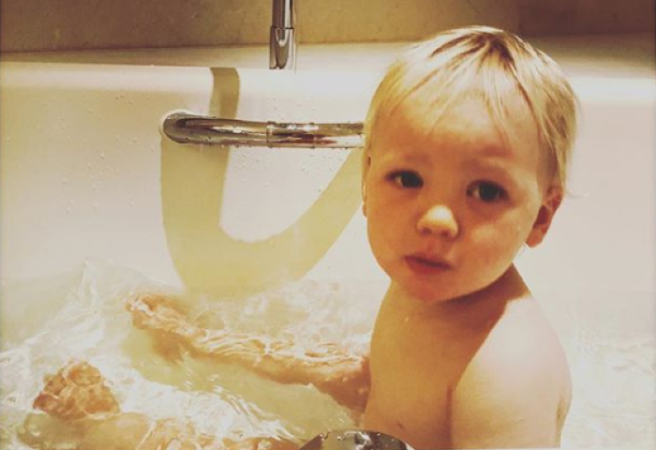 Beach day: Pink shares adorable photo of her one-year-old son | SHEmazing! Pink's son looks like her mini-me in photos from her world tour. The mum has always tried to put family first, even during her hectic career schedule. So she brought her family along with her: children seven-year-old Willow and one-year-old Jameson, and her husband Carey Hart. The kids seem to love their exotic travels and are enjoying their time exploring the world with their parents. Pink shared a sweet photo of little Jameson soaking up the sun on the beach. However, it was not the ocean view that pulled the boy’s attention. Surrounded by golden sand, the one-year-old transfixes his gaze on a tiny beach native – a grey crawling crab. The mum captured the precious moment and posted it on her Instagram saying, “I [love] my little hermit crab, who loves his little hermit crab”. “So sweet! I love watching my littles discover the world,” commented one loving fan. Pink and her family are lucky to have this treasured time together to make one-of-a-kind memories that will last the rest of their lives. But the journey has not been all smiles, for the rockstar fell ill last month, forcing her to postpone one of her performances. After paparazzi spun her story in a negative light, the mum spoke out. “I’m doing my absolute best,” the What About Us singer explained. Now, she appears to have recovered and is dedicating her time off stage to beach days with her little ones. Hopefully, Pink will be able to steal more family moments like this away from the limelight. Meanwhile, her dedicated loved ones continue to show their support.